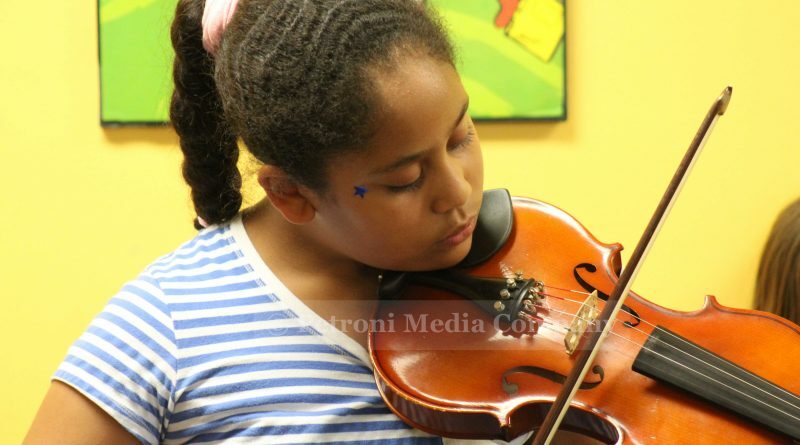 FRAMINGHAM – The Performing Arts Center of MetroWest (PAC), Hoops and Homework, and Centre Music House are partnering to offer free weekly group violin lessons to students at Hoops and Homework in the Pusan Road location. “This initiative was created to give children who are economically challenged an opportunity to have music lessons early in their education. Through the lessons, the students will gain a knowledge and appreciation of music while having fun and playing with their peers,” said PAC Executive Director, Mary Opanasets. In addition to providing free lessons, PAC lends instruments at no cost to these students. Corbit Larson, owner of Centre Music House, offered PAC violins at a greatly reduced rental cost for this program. “Music has the power to bring joy and positive change into the lives of the people who create, share, and listen to it. Understanding and playing music are important life skills and a gift that should be nurtured and shared like any other talent. We are excited to partner with PAC and Hoops and Homework,” he said. Additional funding is being sought to continue this music enrichment at the Pusan Road location and expand the program to include Hoops & Homework’s other location at 12 Interfaith Terrace. The Performing Arts Center of MetroWest provides high-quality, professional instruction in music, theater, and dance for students of all ages. PAC has served the community for more than 35 years and is a 501(c)(3) non-profit organization, an accredited member of the National Guild of Community Arts Education, and a member of the MetroWest Chamber of Commerce. Hoops and Homework offers academic and enrichment services in a safe, fun, learning environment to youth residing around the Beaver and Waverly Street areas. Hoops and Homework is the only neighborhood-based and licensed after school program in Framingham. Hoops and Homework is a 501(c)(3) non-profit organization. Centre Music House is a local family-owned community music school and store founded in 1973. Centre Music House provides private music lessons, group classes, and instrument rental, repair and sales.